In the first matchup on Thanksgiving Day, the Detroit Lions, with 3 TD’s from superstar wide receiver, Calvin Johnson, ran all over the Philadelphia Eagles. Lions’ QB Matthew Stafford tied for his personal best by throwing for 5 scoring passes. The Eagles didn’t know what hit them. Lions 45, Eagles 14. The second game, featured Panthers’ QB Cam Newton continuing to do what he does best, win. The unbeaten Carolina Panthers capitalized on the 3 interceptions returned for TD’s from Dallas QB Tony Romo. Romo may be out for good this season with the same injury (left collarbone) that sidelined him earlier in the year. With the win, the Panthers continue their perfect 11-0 season. Panthers 33, Cowboys 14. In a moving tribute at halftime Thursday evening during the the Chicago Bears-Green Bay game, the Packers unveiled Brett Favre’s name and jersey number next to the retired names and numbers of other Packers’ greats. 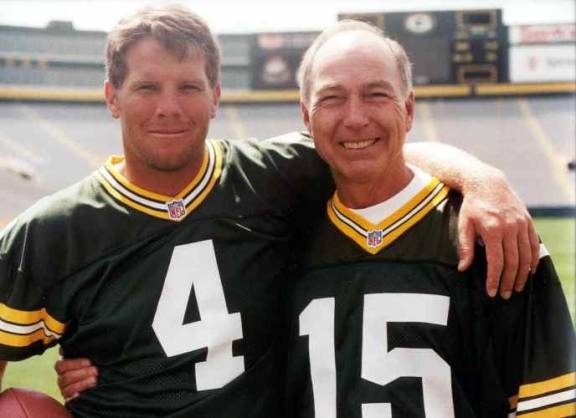 Favre spoke about his love for the game and love for his teammates while former Packer great Bart Starr came out to the field to give him a celebratory hug. That emotional display was the highlight for the fans at Lambeau Field as the Packers failed to hold off the Bears. Chicago 17, Packers 13.